California’s wildfires are still resulting in devastation across the state, with at least 42 dead and another 50 missing, in addition to 6,900 structures that have been burned to the ground. But cooler temperatures and higher levels of humidity have allowed firefighters to contain around 85 percent of the once-uncontrollable blazes, and now, federal and local authorities are starting to turn their attention to the long, arduous process of recovering from the immense damage the fires have wrought. 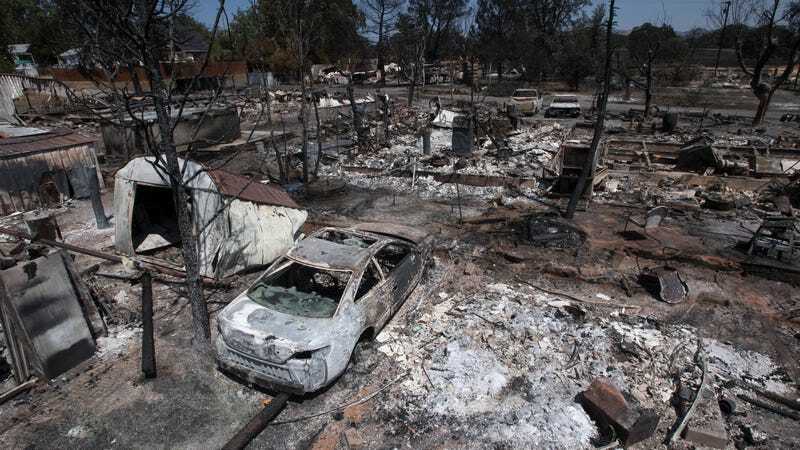 FEMA announced on Thursday that the fires in and around Sonoma County currently rank fourth on their list of disasters, measured by damage and number of people killed in a single incident. Santa Rosa city council member Chris Rogers wrote on Facebook that cleanup will begin “within the next few weeks, with a goal of being done by early 2018.” The Army Corps of Engineers will handle the first wave of toxic testing before handing the recovery effort over to CalRecycle, the umbrella organization that manages the state’s recycling and waste management programs. “It’s just memories that we would like to get. My wedding ring is still there, my charm bracelet that my husband gave me when my son was born. Little things like that. We know we’re not going to be able to repair anything that was burned or anything but I wish that, I hope that my ring is still there,” Escutia said. ICE attacked the Sheriff’s Office in the midst of the largest natural disaster this county has ever experienced. Tens of thousands of people have been evacuated, many people have lost their homes and 23 people have died from this firestorm. ICE’s misleading statement stirs fear in some of our community members who are already exhausted and scared. According to the post, a man named Jesus Gonzalez was arrested on suspicion of starting a fire in a park to keep himself warm, though there’s no evidence to suggest that his alleged actions triggered the disaster. But ICE accused the sheriff’s office of leaving “their community vulnerable to dangerous individuals and preventable crimes,” writing that Gonzalez had been released despite the agency requesting he be held.